Net Weight: Packet (1400 seeds)1/4oz (18000 seeds)(+$6)1/2oz (36000 seeds) (+$9)1oz (72000 seeds)(+$16)1/4lb (288000 seeds)(+$39)1/2lb (576000 seeds) (+$64)1lb (1,152,000 seeds) (+$99) This item is currently out of stock! A highly desirable vegetable that may be served raw or cooked. Popular on a garnish tray, sliced in a salad, or as a flavoring for soups and stews. This plant prefers a sunny location. Water as needed by soaking ground around plants and fertilizing 2 to 3 times during the season. Avoid planting seeds too deep as this is a frequent cause of poor Germination. To blanch stalks, wrap with brown paper or heap with loose soil of shredded leaves. Planting time - Early Spring or indoors in CowPots 8 to 10 weeks before danger of frost is past. 72,000 Seeds/oz. Plant 1/4oz per 100ft row. 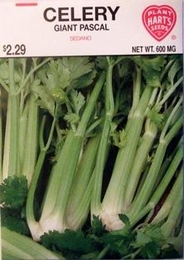 1lbs of Celery seed needed per acre, 4oz needed per acre if using transplants. On average, 1oz of seed can produce 7000 Celery plants.